Android developers India have intended this post to outline major facts about Recyclerview, Butter Knife, and CardView. Read this article and find what they are telling about these products. RecyclerView is version of ListView but with more flexibility used for rendering large set of data in views which can be scrolled and recycled very efficiently. CardView is a new widget and used for showing information inside card maintaining consistent look across platform. It is basically a container in which we can place other widgets. Android Butter Knife is an open source injection and reduction library created by Jake Wharton. Using this library user can concentrate on main functionality of application and reduce writing boring redundant code of initializing views, defining event listeners etc. Finally sync gradle files and you are done with the required steps for configuring Butter Knife library with your project. Lets go step by step now on for better understanding and easy implementation. 3. Create a Java Bean Class named Data.java for holding the information to be displayed in RecyclerView items. Here you see @BindView,@OnClick, @OnCheckedChanged annotation, these are Butter Knife injections. We have Bind our TextViews and Checkbox defined in our row_layout.xml using @BindView annotation and respective OnClick and OnCheckedChanged listeners for CardView and Checkbox using @OnClick and @OnCheckedChanged annotations. 5. Next create Adapter for populating RecyclerView in which we will define an interface with two methods onClick() and onSelectionChange() for handling events, name it View_Adapter. Here, inside onBindViewHolder method we will populate the holder views with the information stored in our Data object class instance and also set the same as tag for respective CardView and Checkbox instance to be used inside onClick and onCheckChange method of View_Holder class. In this we have Bind RecyclerViewusing Butter Knife @BindView annotation. Inside addSampleData we created a sample data list and passed it to RecyclerView Adapter, set this adapter to RecyclerView. 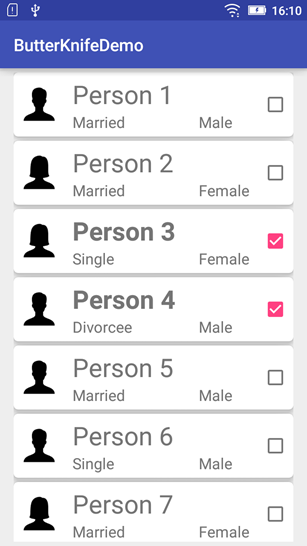 When you run the application, you will be displayed with list of person as displayed in below screen shot. Comments for this blog are open. You can share your views regarding RecyclerView, CardView, and Butter Knife with other readers. You can even ask anything related to these products from android developers India. This article has been written by Rosina De Palma who is a technical writer at Nex Mobility. She is an android developer also. Here she comes with android tutorials for RecyclerView, Cardview and ButterKnife Example.